This section provides an introduction of Minkowski diagram, which represents the Lorentz Transformation overlaying a moving frame into a stationary frame. What Is Minkowski Diagram? Minkowski diagram is a spacetime diagram that overlays a moving frame into a stationary frame to represent Lorentz Transformation in a geometric model. Draw an orthogonal coordinate system of (x,ct) to represent Bob's frame. Draw the ct' axis of Amy's frame along the worldline of Amy's location. Draw the x' axis of Amy's frame by flipping ct' axis against the light cone line. Draw a point E at (X,cT) in Bob's frame. 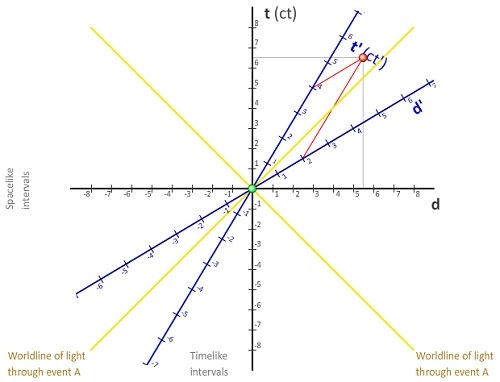 For example, assuming the train is moving at the speed of 0.6*c, an event E at (X,cT)=(5.5,6.5) on Bob's light cone would be observed by Bob in Amy's frame as (X',cT')=(2,4) based on Lorentz transformation.